We have some really terrific deals running at the moment – here’s a quick look! 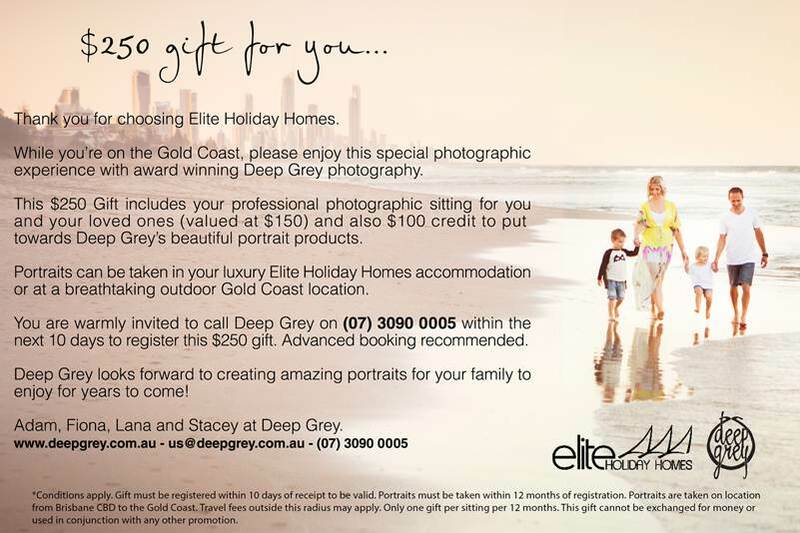 Deep Grey photographers are running a fantastic “Best of Brisbane Luxury” competition at the moment. One of the many prizes is a $300 voucher for Elite Holiday Homes. Head on over and enter – you have until Christmas Eve to enter. Our latest offering for our guests is Hidden Paradise – check out the photos for this seriously stunning property. Be one of the first to indulge at this property for an amazing $450 per night opening special. Book now for December/January at Beachside Ambience and receive a 10% discount. Beautiful home in a fantastic location just steps to the sand. Great shops, cafes, award winning restaurants and Ambience …. it’s where the locals like to be! Get in quick to take advantage of these fantastic deals – give us a call on 07 5592 3881 or contact us by email for more information, exact dates available or to make a booking.